On this map, I have dotted the places I have been to. 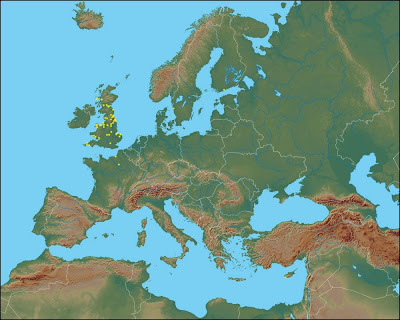 Though, saying that, there are plenty more places in the UK that I've been to, but adding them all would just be a pain, especially on a map of this size. Outside of the UK, though, I only have five dots. Five! Two in France and one in Cyprus, Sweden and Finland. Cyprus was my only real 'holiday' abroad. France was a school trip and Sweden and Finland were more 'visiting people' than 'holiday'. In my family, we were never big on foreign holidays 'cause they cost so much. Instead, we would go somewhere in England, Scotland or Wales in our caravan. My parents, however, have been all over the place in recent years. Ireland, Germany, Belgium, Norway, Italy and a Mediterranean cruise. They went to Switzerland many years ago and once my dad went to South Africa. I'm kinda jealous of them. Ok, I'm going to Belgium in July, and back to Finland, but even with the added dots that my Summerventure will give me, my map will still be so empty. It makes me want to go places like Russia, Switzerland and Germany. If I did that, my dots would soon get more spread out. But, of course I have the travelling bug, I'm in my early twenties! That's when people go backpacking across Europe, right? A friend of mine has already been 'Eurotripping', and she's been to Cambodia and Thailand. I want to travel the world some day. I want to see everything. In other news, I got some weights today from a friend. Big, proper weights. Now I have no excuse for such feeble upper body strength. Gonna work out with these and I'll be super-good at trapeze in no time! Does anyone see me out here? My whole life, I've felt like I'm on the outside, like there's something going on that I'm never a part of. As time has gone on, I've been pushed further and further to the edge of this reality that everyone is living in, only having moments where I've belonged somewhere. So often these days, I feel like I'm alone in a non-world, and it wouldn't really matter if I never went back to where all the happy faces live. All the people who are part of something. I'm desperate for one of them to take me by the hand and pull me back. But I guess that's just how life works. You have to drag yourself through the unknown to get to that shining beacon. Maybe someone will reach their hand out to you to help you on your way. You just have to be careful not to get blinded once you get there. I do have one connection to the world, my very own shining thing I can see through the shadows that obscure the paths to the reality that everyone else lives in. That is where I want to be. Right there in that warm, glowing light. Where is my own light? Can I not use that to see through the darkness? Someone, bring me a match. Let me light the sky on fire so I can join the world. I took the title for this post from a photo of me in costume that showed up on deviantArt. This weekend was the second Nemacon, North East Manga and Anime Convention and I, once again, went as a Hunter from Left 4 Dead. Well, Left 4 Dead 2, to be exact. I kind of wish I'd gotten some proper photos of my costume since I put a fair bit of effort into my zombie-mutated boils and such. A few people ran over and hugged me and many more complimented me on my costume. A few asked me if I had chocolate buttons stuck to my arm, but that was to be expected. It was my first time trying anything like this to this level. One girl ate the blood from the claw wounds on my leg after I told her it was made of golden syrup and coffee. That was a bit odd. There were more L4D cosplayers on Sunday, but when I woke up, I just didn't have it in me to stick latex to my arms and legs and cover myself in facepaint. I wish I'd make myself do it as there was a really kickass Witch I could have got some photos with. My favourite thing of the weekend, however, was that I got to buy the new and remastered boxset of Revolutionary Girl Utena, my favourite anime. 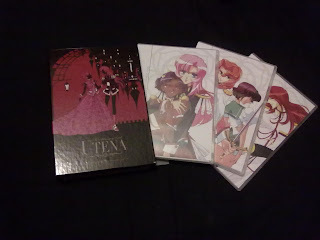 Right away, I wanted to cosplay Utena, the main character, and my sister pretty much ordered me to do it too. When I woke up this morning, the first thing I did was jump in the shower and wash the masses of hairspray left over from my attempt at a really simple backup cosplay for Sunday - Death from Sandman. I should have done it last night, but I was far too busy looking into where I could get a Duelist Ring and reading a Let's Play of the Utena Sega game. After that, I put in the first disc of that boxset into my DVD player. When the menu screen came up and the theme tune played, I couldn't help but smile. When I started the first episode and the opening began, I instantly went from lounging on my bed to sitting upright, facing my TV and giving the show my full attention. I watched this back when I was in school, seeing it an episode at a time, my sister downloading torrents with our dial-up internet. It seems like an age ago since then. My sister always jokes that she made me into a lesbian by making me watch Utena (unknowingly, of course. I'm not out to my family). I laugh, but I think maybe it helped me come to terms with it or something. I know just one thing for sure - The show certainly sparked my love of military jackets. So, I decided to stop eating crap and work out a bit. 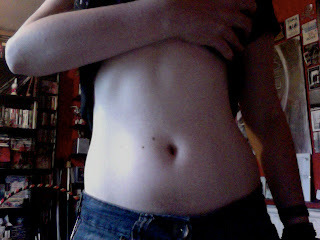 And now, here I am, two weeks later, quite happily starting to see my abs again. Two weeks ago, I couldn't see them at all. I'm not sure at all how I managed that. I am rather proud of myself. It's getting darker as a huge grey cloud covers most of what I can see of the sky from my window. The wind is picking up and I can hear a car or a house alarm in the distance. Is a storm a-coming? I can just about see rain now, and my rats have woken up. Can't tell if that's because of the weather or the sound of the printer. I's a bit eerie, however, since I've just been doing some research for my dissertation regarding zombies and horror films. Speaking of which, I have 6 films and a short television series to watch and 4 films to re-watch. Oh, and read two books (and buy the other ones that I need). All about zombies. And I guess I have to play Dead Rising too. And then write a 5000 word dissertation. If you can call it that. It's more like a long essay. Oh, yes. and I need to finish making a zombie costume. I miss listening to your heartbeat. I miss laughing with you. I miss waking up next to you. I miss holding your hand. I miss watching films with you. I miss watching you play the piano. I miss hearing you sing. I miss you translating things for me. I miss you holding me in your arms and making me feel safe. I miss making food with you. I miss sleeping in your bed. I miss you telling me what to do. I miss sharing music with you. I miss watching you hoop.